While the rest of you are enjoying multiplayer scraps in Blizzard's StarCraft II beta, we recently had an opportunity to go hands-on (again) with the single-player side of StarCraft II: Wings of Liberty. What has changed since last year? Plenty. This time, Blizzard showcased three new spoiler-laden missions from the game's single-player portion, set about halfway through the game, according to StarCraft II lead designer Dustin Browder. We also got a peek at the skill-building Challenge maps, which will push your micro-management and hot key skills to their limits. 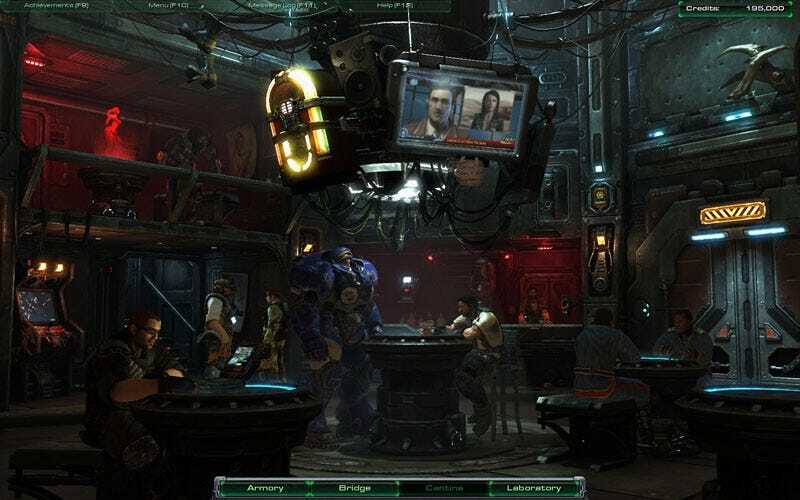 Since Browder believes that new StarCraft II players should spend a minimum of 20 hours playing through the game's single-player side before diving into the deep end of online multiplayer—he also recommends getting your feet wet with two-versus-two battles before playing any one-on-ones—there's more to Wings of Liberty's campaign than just storytelling. Our latest play session started on the bridge of the Battlecruiser Hyperion, with access to the ship's Cantina (where Raynor can catch up on current events, gossip, hire mercenaries and drown his sorrows), the Armory (where one can spend credits to upgrade infantry and vehicles) and the Lab (where the player can interact with Dr. Ariel Hansen and resident ship geek Stedman, as well as research additional upgrades). The Hyperion has had a design overhaul since we were last on board, with the Armory sporting a new look, filled with Firebat and Marauder units, and the Cantina more bustling than before. The Cantina jukebox is also better populated with original songs like White Boy Jones' "A Zerg, A Shotgun and You" as well as covers of songs like The Stooges "Raw Power," Elvis' "Suspicious Minds" and Lynyrd Skynyrd's "Sweet Home Alabama." The top down shooter arcade cabinet, The Lost Viking, was still unfortunately unplayable. Also updated was the Lab, which this time let us research upgrades to Terran structures and unlock new campaign-only unit types. To acquire these upgrades, players must locate batches of Zerg genetic material and Protoss artifacts during missions. And while technically outside of the campaign, the new Challenges—part tutorial, part achievement-hunting trial—are just as intriguing as the Terran versus Zerg versus Protoss drama. If you've played Call of Duty: Modern Warfare 2, think of StarCraft II's Challenges as the game's version of Spec Ops mode. Of the nine Challenges that were present in the build of StarCraft II: Wings of Liberty that we played—three "easy," three "advanced" and three "expert"—only two were unlocked for us. The first, Psionic Assault, was of advanced difficulty, designed to test our unit micro-management skills with a small Protoss force. The challenge equips the player with six High Templars, which can cast a lightning-like Psionic Storm spell on top of enemies and drain an enemy's energy with Feedback, and nine Sentries, a relatively weak ground unit that can attack with an energy beam. The Sentry, however, comes in handy during the fight thanks to its ability to cast force fields and conjure hallucinations that will distract enemies. Psionic Assault is, essentially, a mini horde mode. The level will throw a series of increasingly difficult and varied squads at the player. Those encroaching enemy squads, a mix of Zerg, Protoss and Terran, will force players to switch up their techniques and utilize their High Templars and Sentries effectively to succeed. Each Challenge will grade players on their performance, issuing bronze, silver, then gold achievements based on their score. In Psionic Assault, killing 75 enemies nets you a bronze rank, 150 gets you silver and 225 wins gold. My high score, after about a dozen tries, was 168. The other available Challenge was Harbinger of Death. The reason that this map was deemed of "expert" difficulty was its harsh limitations. Players are only allowed to use keyboard shortcuts to issue commands. You're given a large and varied Protoss alien force, ranging from giant Carrier ships to ground units like Zealots and Stalkers, and scores of docile Terrans and Zerg to kill. The player is given limited time to wipe out as many enemies as possible. To grab the gold trophy, you'll need to be quick with a keyboard shortcut and have the skill to manage a large army, not an easy task. Now onto the Terran single-player campaign, which will not only touch on the game's story—consider this your last spoiler alert!—but also explains how the Protoss mini-campaign comes into play. Our first new Terran campaign mission was a gas grab. Jim Raynor and his crew of merry marines took a job from the dreadlocked Tosh, who we meet earlier in the campaign. The job is the harvest what the humans call Terrazine, but what the Protoss call the Breath of Creation. With a name like that, it's not hard to imagine that the Protoss inhabiting the planet we were on were reluctant to give up that gas to a bunch of lowly Terrans. Each gas jet on the planet had a Protoss altar built around it, with small squads of Protoss soldiers eager to stop Raynor from harvesting said gas. To win "Welcome to the Jungle," we had to harvest Terrazine from seven of the altars that emitted that gas. While Raynor's team escorted an SCV unit to harvest the Terrazine, Protoss forces would attack. Additional Protoss forces would also send automated Probes to seal off those gas jets. While not too challenging on normal difficulty, the base capture-like tactics required adding an interesting spin to the standard resource gathering and unit building. Following a successful win of "Welcome to the Jungle," during which we dug up a trio of Protoss artifacts as an added bonus, we found out why Tosh wanted that Terrazine so badly. Turns out that, unbeknownst to Jim Raynor and the crew of the Hyperion, Tosh is a Specter, a more elite version of the StarCraft Ghost unit. Combine one Ghost, one dose of Terrazine and the galactic element Jorium, and you get a Specter. The fact that Tosh decided to keep that information from Raynor didn't sit well with him, establishing some tension between the two. "I'll be keepin' an eye on you, Tosh," Raynor says. "You can try," Tosh fires back. If you just read our preview of StarCraft II: WIngs of Liberty's single player mode from last year (or you have an impressive long term memory) you may recall that we already played a mission named "The Dig." That earlier mission has been renamed, with the new mission taking its name while adding a new unique element. In "The Dig" we're introduced to the Siege Tank for the first time, the Terran unit that acts as traditional tank in its standard mode, a dangerous mortar-launching cannon in its stationary alternate mode. That mission also gives players control of a unique weapon, the Drakken Laser Drill. This massive drill is pointed at a Xel'Naga temple guarded by a powerful Protoss army. Inside that temple are more Protoss relics that the Terrans want. As the laser cuts through the temple's defenses, waves of Protoss attack the Terran stronghold, all with the aim to destroy the laser drill. Although the Terrans are outmatched, the player can turn the Drakken Laser Drill on his enemies, destroying the powerful Archons and Colossi that would normally present a harsh challenge for the Terrans. After the laser drill countdown completes and Xel'Naga temple is opened, the player having successfully wielded the drill as an incredibly destructive support unit, "The Dig" ends with the Terrans securing the Protoss artifacts inside. Jim Raynor takes the Ihan Crystal given to him by Zeratul, the Dark Templar from the original StarCraft, which lets our human hero relive the memories of his Protoss ally. This first memory is the mission "Whispers of Doom." It starts with a beautifully rendered confrontation between Zeratul, a handful of Hydralisks and the Queen of Blades herself. The mission is one of a smaller scope, putting the player in control of Zeratul and a small group of Stalkers. The mission is mainly a walkthrough of a Zerg infested world, with Zeratul seeking a trio of Xel'Naga shrines. Here, the player learns a bit about how to control the Protoss race in StarCraft II, taking advantage of the Blink teleportation skill and Zeratul's Void Prison, a spell that renders an enemy unit immobile for a short time. It's a fun exercise in micro-managing a small team of Protoss and ensuring that no one, particularly Zeratul, dies. "Whispers of Doom" is brief, but ends with an exciting escape sequence and a Zerg rush, forcing the player to think creatively when escaping the enemy onslaught. So ended our hands-on time with StarCraft II: Wings of Liberty's new content. The new missions that we played, while not radically different from what we'd seen during our previous hands-on time with StarCraft II's campaign, were both enthralling and further enticed us for the other two-thirds or so. The liberties that Blizzard is taking with uniquely single-player units and abilities makes the campaign side of the game feel like the more lighthearted part of the experience. But wrapped in the compelling narrative of the struggle between the universe's three races and the individuals entangled in these wars, it feels easy to lose the recommended 20 hours in StarCraft II's story-driven component.